MJ Simpson presents: the longest-running single-author film site on the web, est.2002. Despite a filmography of 42 features since 2000 (plus a few earlier ones), this is the first ‘Polonia Brothers’ picture I have watched. I do view a lot of odd stuff but I’m pretty sure I would remember if I had seen Preylien: Alien Predators or Snow Shark: Ancient Snow Beast or Peter Rottentail or Curse of Pirate Death or Jurassic Prey or Snake Club: Revenge of the Snake Woman or any of the three dozen or so other titles in that list. And boy, do these guys do titles. I say ‘guys’ but since 2008 when John Polonia passed away, ‘Polonia Brothers’ has been a solo project by his twin Mark. I suspect that’s why there’s a two-year gap between HalloweeNight (listed as 2009) and Snow Shark, after which Mark Polonia returned to his hugely impressive output of two to four features every year. Unfortunately that’s going to be the only usage of the term ‘hugely impressive’ in this review. 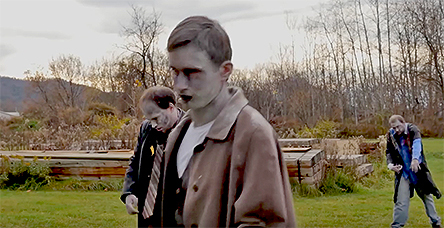 Bigfoot vs Zombies is watchable, if you’re in the mood for lacklustre micro-budget tosh, but I’d hesitate to call it enjoyable. Nevertheless it deserves to be noted, if only for its status as a crossover between two otherwise utterly disparate subgenres. The one thing that the film has going for it is an original setting, which is a body farm. If you’re not familiar with the concept, don’t worry, it’s explained about ten minutes in. A body farm is where dead bodies are placed under controlled conditions in order to be studied by forensic experts. It’s a clever (if gross) concept. If you leave three corpses on the ground and examine one after a month, one after six months, one after a year – then when the cops discover an actual dead body somewhere, the forensics dudes can judge how long it’s been there by the state of decomposition. Obviously any body farm has to be well away from habitation and protected by a stout metal fence to keep out both intruders and wildlife. The object is to see what happens when a human cadaver is eaten by bugs, not by foxes or bears. This particular zombie farm is run by mad scientist Dr Peele (Jeff Kirkendall) and his long-suffering, bored lab/admin assistant Renee (Danielle Donahue). There is a truck driver named Andy (Bob Dennis) who drives around the farm, delivering cadavers to requested locations. And there is a security guard (Todd Carpenter) on the main gate who has no character name. Rather cruelly, the others refer to him throughout the film as ‘the security guard’ despite the fact that he is 25% of the farm’s entire workforce and they must all see him at least twice a day. Stu (James Carolus) and Ed (Dave Fife) are delivering a couple of new corpses in their van. Stu’s an old hand at this, Ed is the new guy. Stu and Andy both constantly hit on Renee who is repelled by their unsubtle advances but takes a liking to nice guy Ed. So, you know, characterisation. The problem is that Dr Peele has been working away in his ‘secret lab’ (which is literally an office with a microscope and a couple of bottles on the desk) to develop a serum which will deteriorate the bodies faster. The idea being that he can then process more corpses through his body farm and thus make more money from the local hospital that supplies them. Don’t look too closely at that plan, it maketh not one lick of sense. Actually the real problem is that, far from deteriorating the cadavers, this serum brings them back to life. 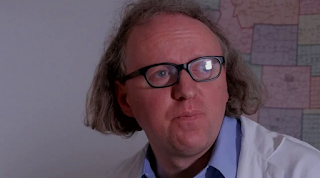 Although it is unclear whether this is due to the injections that Dr Peele has given the dead bodies or leakage from the barrel of the stuff which drops off Andy’s truck near the start of the film. Much later, it is discovered that an overdose of this stuff will actually kill a zombie but this is never followed up on, as if both the characters and the director simply forgot this ever happened. As the dead start to rise, one more character arrives at the farm. 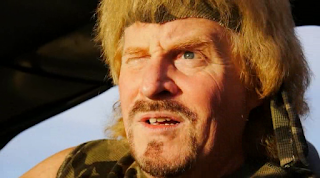 Duke Larson (Ken Van Sant) is a big game hunter called in by Dr Peele because Andy has reported that one of the shallow graves has been dug up, presumably by a bear that has somehow got into the compound. Well, strictly speaking two more characters arrive because here comes Bigfoot. 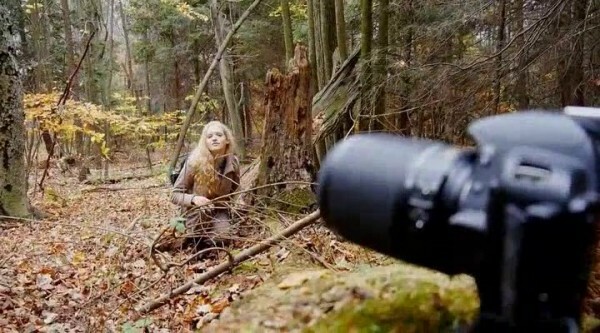 We have already met him in a prologue where he spies on a hiker/photographer (Greta Volkova) who is later munched by a zombie after somehow getting past the security fence. For no reason at all, Bigfoot hides in the back of Duke Larson’s Jeep to get into the farm, where he starts fighting zombies. The last part of the preceding sentence sounds very exciting and is the nub of this high-concept film whose title basically is it plot. And kudos to Polonia for the amazing sleeve art showing a giant, fearsome sasquatch hurling itself at a shuffling army of the undead. But you won’t be at all surprised if I tell you that there ain’t nuttin like dat on show here at all, no sir ma’am. This film’s Bigfoot is, well, it’s an ill-fitting, tatty gorilla suit with a long, shaggy wig over its face. It’s really one of the very worst Bigfoot costumes you’ll ever see. I know the movie isn’t exactly taking itself seriously but nevertheless this is just kind of embarrassing. Uncredited on screen, the actor inside the suit is Steve Diasparra according to the old IMDB and he does at least attempt to give the creature some characterisation, establishing a mute, somewhat touching relationship with Renee. At various points in the film we do get Bigfoot fighting zombies but it’s all really half-hearted and lame. Basically they shuffle towards him and he pushes them away. In fact, that’s the film’s biggest failing: it is utterly devoid of even the slightest hint of action. There’s gore, certainly. Or at least, there’s fake blood in some scenes as people scream. But obviously they couldn’t afford to get any of that on the gorilla suit as the dry-cleaning bill would have trebled the film’s budget. So we have lackadaisical shuffling scenes, and shots of bloody terror, but nothing inbetween. No actual fast or emphatic movement. Even in dialogue scenes, people just stand around talking. Then they walk somewhere. It’s like they can’t do both at the same time. There are a few nice bits of dialogue but the quality of the acting is generally poor. Most of the cast have been in various other Polonia pictures and some have other credits at a similar level, but nothing notable. And, for all his experience in film-making, Polonia’s direction remains thoroughly pedestrian. Cut to Renee; Renee says line; cut to Ed; Ed says line; cut to Renee, Renee says line... and so on. There’s no flair here, but there’s also no real sense of storytelling or atmosphere. It certainly kills any potential comedy moments stone dead. There’s no verve, no pizzazz, no oomph in any scene in the entire 79 minutes. 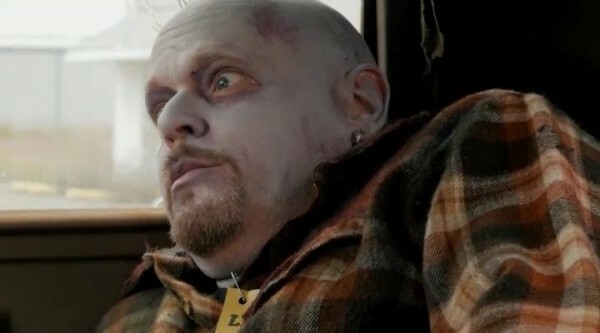 And if there’s one thing that a film called Bigfoot vs Zombies should have it’s oomph. I don’t think anyone ever actually runs anywhere in the entire film. A sequence in which Duke Larson drives his Jeep across the farm, shooting at zombies with a pistol, is probably the closest we get to any action - but there again the direction hobbles the potential enjoyment. We have close-ups of Van Sant in his jeep, and cutaways of zombies falling over, but no shot of the Jeep actually driving past zombies as Larson blasts them out of the way. Yes, budgets (or lack thereof). Yes, shooting schedules. Yes, lots of other limitations on micro-budget indies. But there are plenty of micro-budget indie pictures which manage to stage action sequences, which manage to film exciting scenes, that demonstrate oomph or just where characters, y’know, run. The film carries a 2014 copyright date, is listed as a 2015 picture in the sales agent's publicity, and eventually appeared on DVD and VOD in February 2016. Mark Polonia's subsequent films have been Sharkenstein, Land Shark and Amityville Exorcism. You've got to give the guy props for coming up with titles (and commissioning great sleeve art). I can’t say that Polonia’s movie is the worst zombie film out there, not by a long chalk. Neither am I convinced that it’s the worst bigfoot movie ever made. And certainly within that tiny lozenge at the centre of this previously unconsidered Venn diagram, Bigfoot vs Zombies holds its own – primarily because of the absence of any other pictures that tick both boxes. But I can’t help feeling that this could have been better, without too much additional effort. It honestly doesn’t look like anyone had fun making it. Maybe they did, but that doesn’t come across at all. And with a film like this, if it doesn’t seem like it was fun to make, sadly it’s not much fun to watch. Still, it hasn’t put me off watching other Polonia Brothers productions. And boy, do I have a lot to choose from. My original site was launched in January 2002, transferring to Blogger eleven years later. In 2016, when I finally completed the transfer of my old content, the site had grown to 1,000+ reviews and interviews totaling more than one and a half million words. I hope you find something of interest. Looking for my reviews of Richard Driscoll's film?